My computing world has become very open source oriented. I am getting deeper into it than ever before. I have come to trust some of the better products like Joomla! and found that when you participate in the open source communities surrounding them you meet a lot of very smart and generally nice people. I also discovered that many of the best open source developers are Mac users. Why do you suppose that so many great content management, ecommerce, bulletin board, and blog developers are huge Mac fans? It's probably for the same reason that I have been a Mac enthusiast for so many years. It has been great not having a continual and complicated war with viruses and anti virus programs. At one time all my Mac computers ran virus programs and we did the updates on a regular basis but when it was discovered that the virus programs themselves were the major cause of problems on the computer that was the end of that. Mac users enjoy a world where this threat is almost non existent. I have friends that are PC network IT managers who spend up to half their working day dealing with the virus issue, researching, testing, making sure the latest patches don't mess everything up, and so on. I do not envy them at all. Networking and network printing on the Mac has traditionally been a breezed compared to the PC world. Mac networks are easy to run and maintain. It's not perfection but it's simple to teach someone how to look after and troubleshoot Mac environments. Corporations would experience major cost savings for their IT budgets by running Mac systems. These things alone are not the real reason that so many developers use Macs. Really good developers design from the user experience point of view. After all, if the program is good and the user experience is pleasant, what better combination can there be? There are few better examples of this than Apple computers and software. The Macintosh computing user experience in itself has always been terrific. Macs are just plain easy to use and they are very stable. Mac users don't know what it is like to have to restart their computers on a regular basis to ensure trouble free computing. With each Mac OS release it is more fun to use a Mac. Over the last year I have seen many PC users switch to Mac computers. Some did it on their own and others were hired by companies that use Macs. Each of those former PC users that I have spoken to tell me they love the Mac computer experience and can't believe how easy it was to switch. None of them would ever go back to using a PC. You can run a variety of operating systems on a Mac and while this can be done on other computer hardware as well, it's just really nicely done on the Mac. Flipping back and forth between operating systems, including the Windows OS, gives you the benefits of the Mac and the other systems you also need to use. About a year ago I went into a PC only environment with my Mac PowerBook and switched to Windows OS and ran it full screen. The IT manager spotted my computer and couldn't believe that Windows was running on a Mac, he simply hadn't seen that before. He was still doubtful and asked if he could use my computer to try a few things and I handed it over to him. Immediately he went to the network and I heard him saying 'wow, I can see the whole network, I can do this, I didn't think it would do that!' He switched to the terminal and started sessions and checked other things that he figured wouldn't be easy to emulate on a Mac. After a few minutes he turned to me and said, 'this is just like being on Windows!' I told him he indeed was on Windows, and he was also on a Mac. The majority of PC users still have no idea how easy it is to use the Mac and that there isn't any good reason not to use them in most business environments today. The argument about Macs being more expensive has been proven to be completely wrong long ago. There have been many white papers published dealing with ROI which have proven that it's Macintosh computer systems that are less expensive to run vs. others. This was even when the initial Macintosh purchase price was higher than other hardware platforms. This too is not the case anymore when you compare feature for feature against other computers. Macintosh software really shines when it comes to graphic capabilities and always has. Occasionally you will hear a Mac designer or user complain that a particular software isn't 'Mac like' which simply means that it was probably created on another platform and ported to the Mac and it's not intuitive to use and it's GUI and user experience are poor. Mac users tend to have a low tolerance for poor software design since from day one using good Mac software is an elegant experience. You can run Joomla! and other open source projects on your Mac in a development environment using top notch graphics tools to put together fantastic looking and well thought out software. 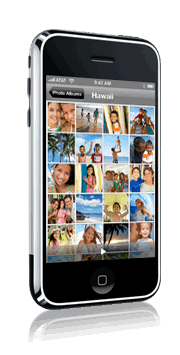 A good user experience is responsible for attracting a large following. Some open source projects have high capabilities, but when they look like they've been created by someone that has no sense of design and doesn't care that it takes almost a degree in mechanics to figure out how to use the system, only those that are willing to suffer a sterile and blase interface will be attracted to them. Joomla! still lacks some functionality other systems already have, yet it has attracted a huge community of users who are willing to be patient and wait for those capabilities to be added in the future. When they are added, look out, the objections for not using Joomla! will be hard to defend. 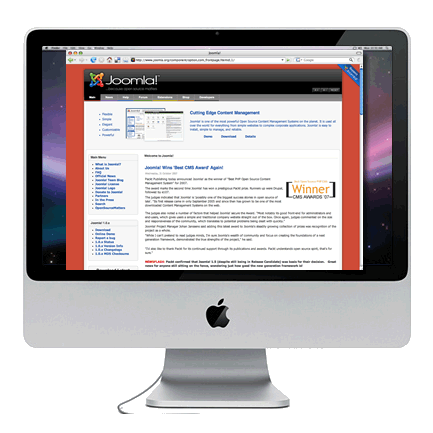 So Macs and Joomla! are a great one-two combination, and many talented open source developers know this. You work hard every day, why wouldn't you want to use great tools to do your job? The less problems you have with your hardware and operating system, the more time you can spend doing what you need to do. The better the experience you have while you are doing it, the more you will like what you are doing and the more productive you will be. I can't help wondering if when your tools are fun and easy to use that you just simply get better at what you do. It's kind of like making music on a great instrument. What better combination can there be?